Risk management is a field of business that identifies risks and works to prevent them from occurring. A basic definition of a risk is an uncertainty that could affect the outcome of a project or activity. A humorous introduction to risk management is this clip from the sitcom Seinfeld. In this clip, George has to learn about risk management, but doesn't want to read a large textbook on the subject. 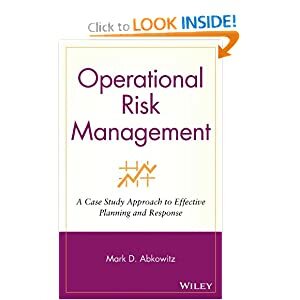 I recently finished reading Operational Risk Management by Mark Abkowitz. I found the book in the local authors section at a Barnes and Noble in Nashville, TN. The book consists of tragedies in three sections: man-made disasters, terrorist acts, and natural disasters. The fourth section, on success stories, ends the book on a bright note. Although the information is excellent, I found that I could only read one chapter at a time because of the heaviness of the disasters - many with loss of life. Abkowitz begins the book with the observation that some or all of these risk factors were present in these stories. An overall theme of the book is that by reviewing case studies where risks were known but no actions were put in place to minimize them or eliminate them, we can ensure that the projects we work on can avoid these same pitfalls. Risk factors work together to generate an event with disastrous consequences. Communication failure is a risk factor in every disaster, regardless of the cause. Take planning and preparedness seriously. Failure to follow procedures is a problem in both man-made and natural disasters. Despite the best preparedness, not every situation can be anticipated. It usually takes a disastrous event to convince people that something needs to be done. If you found this post helpful, please comment below and share on Facebook. Douglas G Pratt.